The folks at Rebellion Developments have revealed quite a number of details regarding the upcoming DLC for Sniper Elite 4 including the game’s first major single-player and multiplayer content update as well as what’s in store for the next few months. First off, towards the end of March, two pieces of content will be released for the game, Deathstorm Part 1: Inception and the Night Fighter Expansion pack. The former is the opening chapter and missions for a completely new three-part mini-campaign that features a new storyline for either single-player or two-player co-op. The latter is a content pack that comes with three new weapons, night-time camouflage rifle skins for eight weapons, and two new characters. 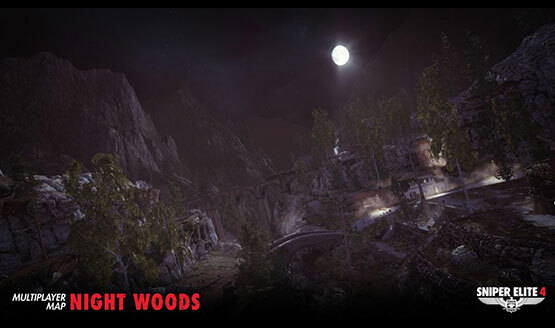 March will also see a brand new multiplayer mode called Elimination and multiplayer map called Night Woods. The developers also released their DLC roadmap for the next few months which include Deathstorm Part 2: Infiltration, an Urban Assault Expansion Pack, a new multiplayer map called Urban, a new multiplayer mode, and a new Survivial missions for solo and up to four-player co-op, slated for late April 2017. May and June 2017 will then see Deathstorm Part 3: Obliteration, the Cold Warfare Expansion Pack, the Lock and Load Weapons pack, two new multiplayer maps called Fortress and Bunker, and a new Survival mission for solo and up to four-player co-op. All the upcoming Survival missions, multiplayer maps, and multiplayer modes will be released for free for all players. Paid content, such as the expansion packs, will be included in the game’s Season Pass or available for purchase separately.